All who know Mr. George Owen, of Manor Farm, Kenstone, in the Tunstall District, will agree that he fully deserves to be classed with that noble band of workers we call ‘Local preachers worth knowing.’ He was born at Little Bolas, near Wellington, Salop, in the year 1834 While still young he gave his heart to God under the preaching of the Rev. W. Spencer, returned missionary from Africa, belonging to the Wesleyan church. He forthwith joined the Hatton Heath P.M. Society in the Prees Green circuit. He felt as a young man that it was a blessed thing to be an Englishman (how fond he still is of that old song – A true-born Englishman! ), to belong to the commonwealth of England, but he felt to be a church member was a greater thing. Not long after he had joined the church he was put on the plan. When the Rev. John Webster travelled in the Prees Green Circuit he fell ill, and Mr. Owen was asked to take his place, and did so, carrying on the circuit work until Conference met; this work he did with great success. The Rev. Elijah Cooper also falling ill on the same circuit he was invited to fill his place as travelling preacher, which he did for the space of six months, until health was restored to Mr. Cooper. As a preacher he was long famous, his services being most frequently requisitioned for special sermons, not only among Primitive Methodists, but also for various Congregational Churches in his native Shire for months together. He was one of the busiest of men, as may be inferred from the following facts. He is a member of the Market Drayton Board of Guardians, the District Council. Parish Council, and also a member of the Board of Management for the Hodnet Day School. He farms a large farm on the Hawkstone Estate and is also a coal merchant. His life has been more active than at present, for he now has the splendid co-operation of two of his excellent sons. For many years he was the circuit steward of the Prees Green Circuit. He has represented the circuit many times in the District Meeting and has been sent as special deputation to the Conference. He helped to build most of the nine chapels in his circuit, and two years ago had the joy of reporting to the District Meeting held at Tunstall that, under the ministry of the Rev. H. Owen, the whole circuit had been freed from debt. For over forty years he has been ever at his post, Sundays or week-days, when not called from home for special preaching, or to preside at special functions. For many years he has been a member of the District Committee, and though not often able to be present he has ever taken a lively interest in the work of the District, and was one of the first to take an active interest in the new Mission Car for the Tunstall District. He is generous to a fault; his gifts have been most numerous. Many men have been saved from bankruptcy, and others from the Workhouse, through his benefactions. He glories in Primitive Methodism, and loves its history, and grows quite radiant as he tells of the Revs. 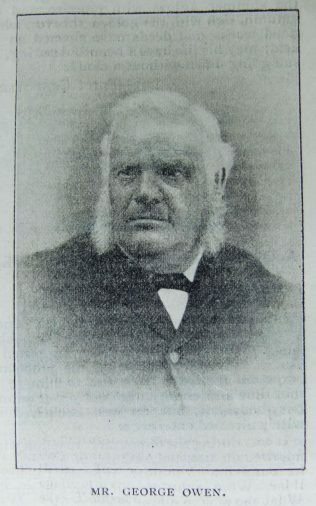 James Grieves, Joseph Hall, John Guest, Samuel and William Antliff, Philip Pugh, and Dr. Wood, Mr. Thomas Bateman and other worthies of the past generation. He is a sunny Christian, and has ever welcomed to his hospitable home the servants of God. Some ministers still with us today speak of the great sumptuous repasts they have seen and enjoyed at his home, under which the table literally groaned. In his day he has been a good singer, and all who have visited his little Cathedral, slumbering in that perfect valley, happily named ‘Paradise,’ have been impressed with the man’s ruddy countenance, robust figure, snow-white hair, earnestly chanting the melodies of praise. Much of his financial and spiritual prosperity is due to his industrious and plodding wife, who is as true as steel to all that which is noble and good. He has five children, four sons and one daughter, one of the sons having taken the Conference scholarship, is now a professor in Harrogate. May his life be long spared to the church of his choice, and may he by the Grace of God carry himself to the end like an orange tree in the garden, swinging perfume from every little censer it holds up to the air. May his life be like the day, more beautiful in the evening; or like the summer aglow with promise and the autumn, rich with the golden sheaves, where good works and deeds have ripened on the field; may his life have a beautiful setting, his sun going down without a cloud. George was baptised on 7 September 1834 at Great Bolas, Shropshire. His parents were Thomas, who worked the land, and Margaret. George married Elizabeth Yale (b abt1852) in early 1871 in the Market Drayton Registration District. Census returns identify six children. George died on 9 May 1903 at Hodnet, Shropshire.